Please read full advertisement to understand the “Requirements” because if you send/submit the applications without being eligible, you will be wasting your time because application sent to the officials will not be entertained in any way. 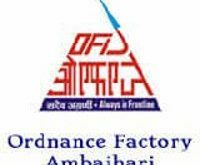 So, before things get ugly (it is late), jump to the PDF link to Ordnance Factory Ambajhari Semi Skilled Notification which is smoothly reachable through the PDF link given at the bottom. Class 10th + NAC / NTC issued by NCVT in the relevant trade passed individuals are eligible to apply for the Ordnance Factory Ambajhari Recruitment 2017. Between 18 to 32 years as on closing date of online application. The Upper Age Relaxations will be applicable as per Govt. order / rules. § Trade Test (Practical) at respective factory along with document verification. On the basis of merit list based on marks obtained in written test, candidates 1.25 times the number of vacancies shall be called for Trade Test (Practical). The candidates are required to pay a fee of Rs.50/- (No fee for SC/ST/ Female/ PhysicallyHandicapped candidates) either by payment gateway integrated in the website by using credit card, debit card or net banking or by depositing the money in any branch of SBI by cash (through challan downloaded from IOF recruitment website). Eligible Interested ITI Candidates Apply Online through OFB e-Portal. All the candidates including Ex-Trade Apprentices of Ordnance Factories are required to apply online only. The OFRC short advertisement published in Employment News Paper dated 27th May – 2nd June 2017 Issue.